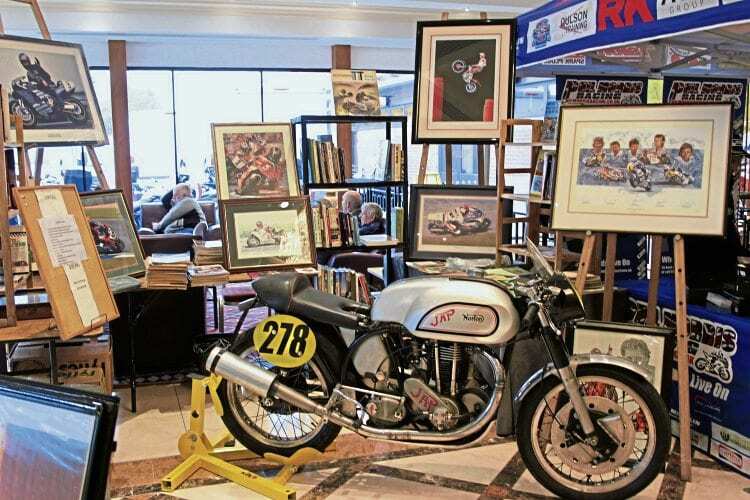 Regular readers of OBM will know that the National Motorcycle Museum in Solihull – right next to the crux of the M6 and M42 motorways, and smack-bang in the middle of the country – is a treasure trove of classic British motorcycles and the history surrounding them, writes Dave Manning. Those of us who have made the pilgrimage to the museum will likely think that there is little way to improve the experience, aside from having more time to browse the halls. However, the team behind the scenes have, incredibly, found a way of making it better, even if for only one day per year. By throwing their doors open to the general public – free, gratis and for nothing – and using the reception and function rooms to facilitate trade stands and a presentation stage, they have ensured that the museum is packed full of appreciative punters for one day in late October. Art, books and an ex-race Norton single. The only thing missing is a fine single malt. The stage, in the museum’s Britannia Suite, saw host and commentator Steve Plater introduce and chat to Norton Motorcycles’ head honcho, Stuart Garner, and chief designer, Simon Skinner, about not only the V4 race bikes that have seen action at the Isle of Man TT over the last few years, but also the new road-going V4 race replica, and the new 650cc twin-cylinder machines that were launched at Motorcycle Live just a couple of weeks later. The race and road V4s were started, in the Britannia Suite, for all to hear. Of course, Steve Plater is a Norton test rider, and he also chatted to John McGuinness, who races the new V4, while previous Norton racers Trevor Nation and Mick Grant also graced the stage. Further race stars were in attendance, notably TT ace Alex George and John ‘Mooneyes’ Cooper. Read more and view more images in the December 2018 issue of OBM – on sale now!